At our last Stamp Club I taught them how to can gifts. You basically just cut the bottom of a can open with a safety can opener, fill it with a gift and seal it closed with Crystal Effects. 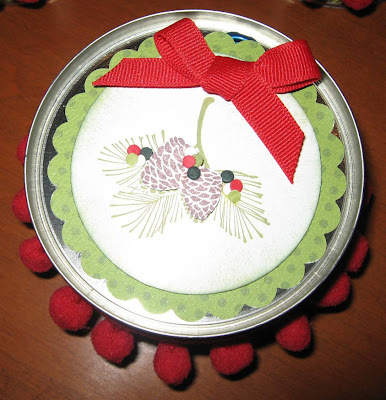 Joyce, made these darling gifts from short pineapple cans. Aren't they darling? 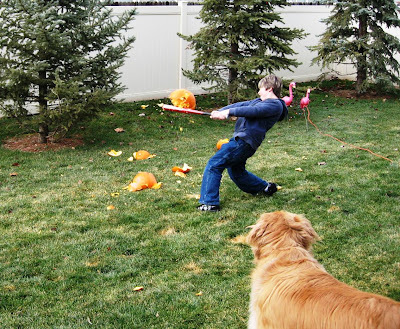 We had a bit of sunshine and the snow had melted last week, so it was time to get in the ceremonious end of season pumpkin baseball game. The pumpkins are pretty gross after they've been frozen a couple time...but it never stops my kids especially my ring leader husband!!! Nicholas smashes a big one! Benjamin in on the fun too! 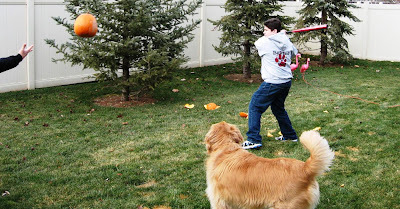 Sarah awaits the real baseball as she is a retriever you know.,..she refuses to retrieve pumpkins! Love the project!! Very cute! LOVE the photos..LOL!!! Too funny! Your family looks like they are having a great time! Hi Becky, A friend and I took your canned gifts idea and ran with it. Thanks for the inspiration. If you want to have a looksie, please do. I gave you kuddos too. Loe the creations! Thanks for sharing those FUN pics. Wish I could do that. Love your Golden, looks just like mine. 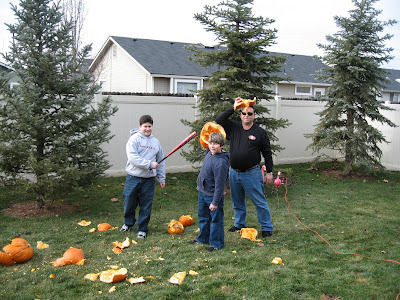 What a lot of fun your family has doing the baseball pumpkin game LOL!!! 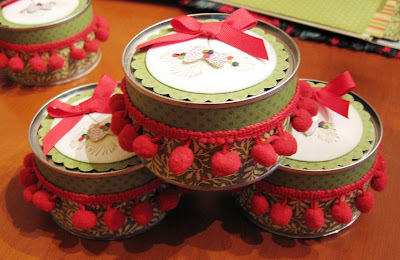 The gift cans are a GREAT idea! Thank you so much for telling us 'how' to do it. I never could figure out how to put the can back together! Great pictures. My Golden won't even retrieve a baseball. He watches it drop then turns to us w/ a look that says something like "You, with the thumbs, you go get that, k?"